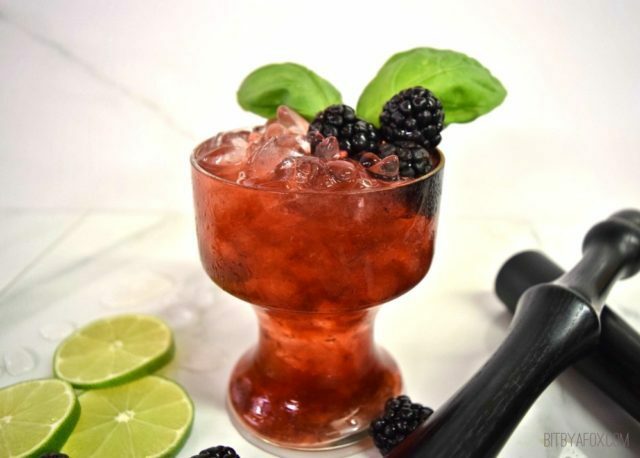 Muddle blackberries, basil, lime juice and agave in a mixing glass. Add tequila and sherry, gently stir. Add ice and stir again. Fill rocks glass with crushed ice and strain cocktail into glass. Top with a splash of soda water and stir. Add more crushed ice, basil and blackberries for garnish. Slice off the bottom of the stems; then, use a moist paper towel to gently remove any dirt from mushrooms. Quarter or halve the mushrooms, depending on the size. Sprinkle water in the bottom of a 13 x 9 baking dish then place mushrooms in a single layer on top of the water. In a small bowl combine next six ingredients: breadcrumbs through salt/pepper. 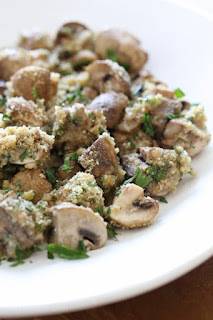 Sprinkle mixture evenly on top of the mushrooms. Drizzle evenly with olive oil then spray the top with olive oil spray so it's evenly coated. Bake uncovered until the mushrooms are golden, about 20 minutes. Serve hot or warm. While the oven is preheating, place 1 tablespoon of the butter in each of two 10-ounce ramekins. (You can also bake this in a dish that holds 2 cups of liquid). Place the ramekins in the oven while it preheats, but keep an eye on it--don't let the butter brown. Meanwhile, peel, halve, and pit the peaches. Stir together the peaches, 1 tablespoon of the sugar, the lemon juice, cinnamon and vanilla in a bowl, and set aside while you make the rest. Whisk together the flour, the remaining 3 tablespoons of sugar, and the baking powder. Lightly stir in the half-and-half---small lumps are okay. Spoon the batter over the melted butter in each baking dish, and DO NOT STIR. 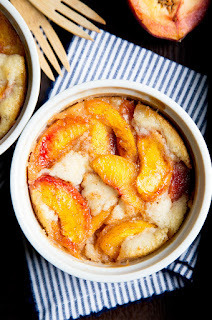 Evenly pour the fruit mixture on top in each ramekin. Bake for 30-35 minutes, or until the crust is golden brown.